Regular readers may remember a few years back I was contacted by London photographer Martin Usborn, who wished to visit Spain to photo the galgos, and wanted the details of a couple of refuges to contact. The result was a stunning coffee table book. Here are links to 2 interesting articles which have appeared in National Geographic magazine, the first one being an interview with Martin. If you have a dog with Separation Anxiety, you might like to look at this available help. Remember Martin Usborne visiting Spain to photograph the galgos and podencos. His book launch is Thursday, 23rd July in London...all details here. Please go if you can. From Pyramid to Perrera - The Story of the Podenco is now published as an ebook in French. Purchase your copy here. 20 years ago Jane and Alan Brian moved to Spain to open a caravan park. Instead they found a hung galgo in the olive groves around them and started their journey to save and rehome hundreds of dogs. Alan write amusing and poignant verse and I have now collected these into a book, interspersed with stories of some Pepis dogs who found forever homes. 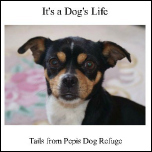 Please buy a copy, all proceeds from the sale will go to the Pepis dogs, including podencos. It's Print on Demand, so will only be printed when you pay for it, allow 2 weeks. An ideal present for your dog-loving friends. Here is a taster of my book 'From Pyramid to Perrera - The Story of the Podenco'. Print version on sale shortly. Posted on my facebook page, No author's name. My dogs live here; they're here to stay. They will alert you're at the door.